Last year (actually circa January/2014), I found myself struggling with four terminal emulators open, and I knew it was time to work on improving my workflow. I had already heard about those terminal multiplexer thingies, and they seemed to be what I needed. 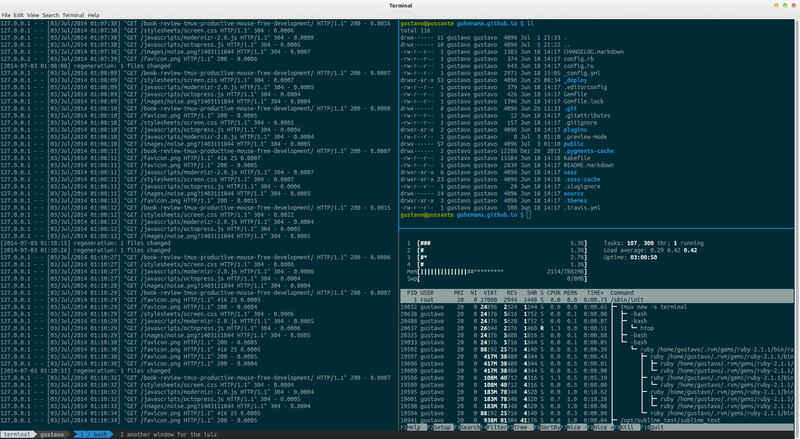 After some research, I decided to stick with tmux, and it’s freaking awesome. Below is a picture of tmux running on the Gnome terminal. It features the Base16 Solarized color theme, my custom tmux colors and the Ubuntu Mono derivative Powerline font. The thing is, there are lots and lots of tutorials on tmux, but I could not find a canonical reference to it - until I discovered this book from the The Pragmatic Programmers series, tmux: Productive Mouse-Free Development. [PREFIX] is CTRL+B or CTRL+A, depending on the settings (mine is CTRL+A). Programs or processes can be started up inside tmux, and then be left running on the background. Show tmux bindings: PREFIX + ? Keys can be bind to a series of commands by using \;: bind R source-file ~/.tmux.conf \; display "Reloaded!" Custom scripts can be built to automate certain editor tasks. tmuxinator can be used to write and manage different tmux configurations. Move the cursor to where you want to start selecting the text, press SPACE and move the cursor to the end of the text. Press ENTER to copy it to the buffer. Turn a pane into a window: PREFIX + !